I haven't written anything here all week, and I am feeling rather guilty as a result. But it is Sunday, and I am lying in bed with my laptop, so I thought I would say hello. Its been a tough week again, lots of pain, this time in my neck and shoulders. A great deal of Deep Heat cream, the laying on of hot water bottles, and some healing from Pat has helped a lot. I still feel like I have lost four days, though. When the pain is that bad, I can't think of anything else. My mind goes all woolly. It is hard to write, or read, or do anything. On the other hand, Spring is really on her way now. I can smell it in the air. The days are getting longer, the snowdrops are up and before long we will have daffodils. I managed to do some tidying in the back yard, and found some primulas that are putting out buds, so I hope I will have some colour out there before long. The forecast says 12 degrees next week, positively balmy. This winter has been so cold for so long. We all just want to see the back of it now. I have some fun activities in the next couple of weeks to look forward to. Most exciting is our 'Coven meeting'. I have two friends who I have known since school, and every year we meet up for what we call our Coven, an opportunity to gossip, eat great food and catch up. We used to stay over with one another for weekends, but since babies started arriving, that has been difficult, so its just been lunch together in London. This year, though, we are all going to stay with Jacqui and Paul at their home in Warwickshire, so husbands and kids will all be included. Its going to bedlam (and a very long drive), but I am so looking forward to catching up. Promise lots of 'then and now' type pictures! Bex grew up on the Hampshire coast,and now lives in rural Norfolk with her husband, whisky writer and academic, Pat. 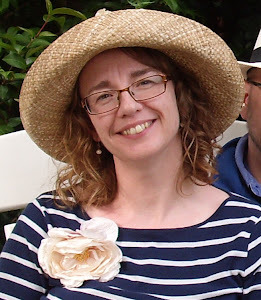 Apart from coping with her ME/CFS, she is tinkering with her novel, The Seventh, about vampire gangsters, and a new work of fabulous Victorian sensuality called 'The Butler Did It'. If you can come up with a better title, please let her know. She also enjoys making cartoons and illustrations in ink and watercolour. The new cottage garden is coming on nicely. You don’t have to get it perfect, to get it just right. SARK, Make your Creative Dreams Real: A Plan for Procrastinators, Perfectionists, Busy People, and People who would really rather sleep all day.